Axe throwers are aiming for Scone Palace this summer as the attraction gets set to host the Scottish axe throwing championships for the first time. 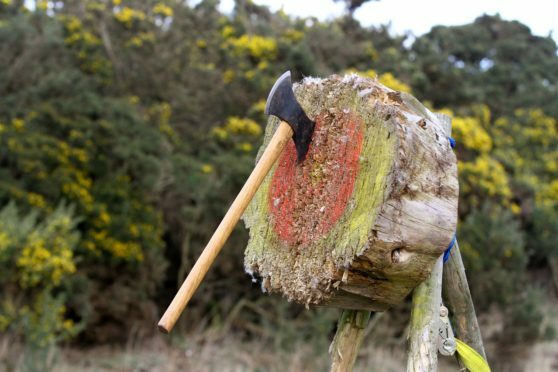 Around 2,000 people are expected to converge on the Perthshire venue for the Braveheart Scottish Axe Throwing Open on Sunday May 5. Axe-wielding competitors will travel from across the UK, Ireland and Europe to take part in the annual games, now in their 15th year. In addition to the championship, visitors will get the chance to throw some axes of their own. Jamie Keddie, of hosts Braveheart Axe Throwing, said actors such as Jason Momoa and TV series such as Game of Thrones and Vikings had sparked interest in the sport. He said: “Scone Palace is the perfect location for such a prestigious event; a location so steeped in history only adds to the spectacle and allure. Members of the Scottish Knight League, many of whom competed in last year’s International Medieval Combat Federation (IMCF) World Championships, are returning to Scone Palace for the event and will be demonstrating their skills during the day. Stephen Brannigan, Head of House Opening at Scone Palace, said: “After the success of hosting the IMCF World Championships in 2018, we are delighted to be welcoming another sporting tournament with an international appeal at Scone Palace this summer. “The Braveheart Scottish Axe Throwing Open is going to be a spectacular sporting event that is definitely best seen in person. Visitors will be able to explore a food village and on-site bar, buy medieval style merchandise and get their photograph taken with a Blackadder impersonator. There will also be music from Scottish tribal band Clann an Drumma and historical King Robert the Bruce re-enactments from Strathleven Artizans.